Legions of sozzled Santas ran riot in London’s streets today as the annual ‘Santacon’ pub crawl returned to the capital.Thousands of revellers donned full Father Christmas outfits for the raucous parades through streets and parks across London. With four separate parades in different corners of the city, the Saint Nicks set off at 12 and began an afternoon of open-air boozing and revelry. Tube stations in central London were at times awash with a sea of red and white as parade-goers headed to the next destination. Santacon also takes place in some 300 towns and cities around the world, from New York to Moscow and Hanoi to Durban. 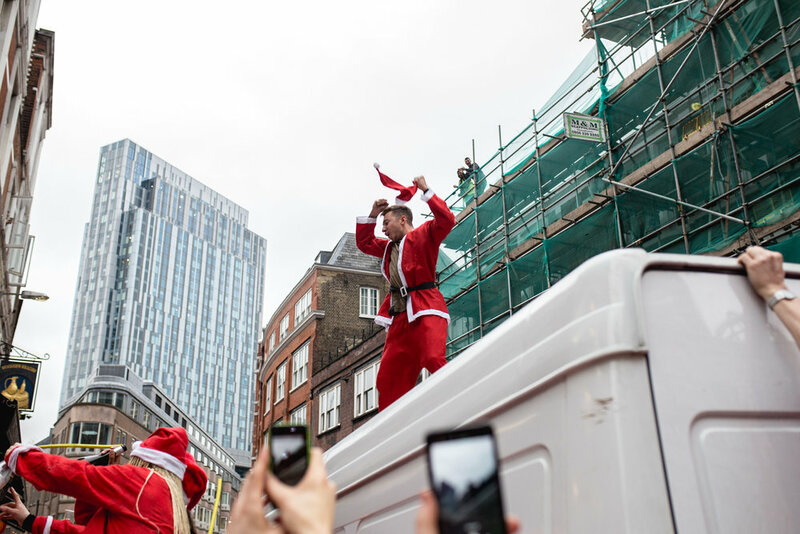 The London event page stated: “There’s no particular reason to dress up in Santa suits, run around, give gifts, sing songs, have strangers sit on our laps and decide who is naughty or nice. “But it’s a lot of fun so Santa does it anyway!